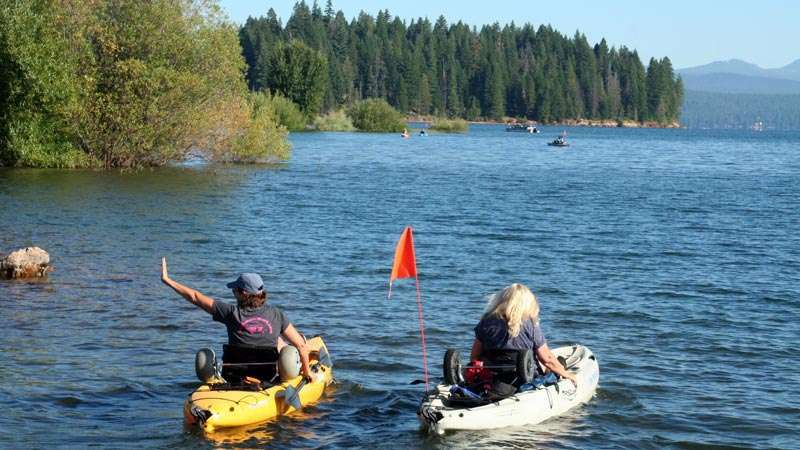 The second annual Poker Paddle, one of the newest Almanor Recreation and Park District fundraisers, combines kayakers, canoes and paddle boarders with poker play. The event is scheduled Saturday, July 28, with check-in/registration beginning at 7 a.m. The Poker Paddle begins at 8 a.m.
To pre-register online, visit yourarpd.org or Eventbrite.com. Registration fees are $50 for a single paddler; the second paddler in the same vessel is $30. The aquatic event begins and ends at Plumas Pines Resort & Bar, 3000 Almanor Drive West in Canyon Dam, with those participating choosing either a 4 or 9-mile course. Organized by ARPD, there will be three floating rest stops along the route, with snacks provided. Participants pick up a poker chip at each stop corresponding to a playing card to form a poker hand at the end of the excursion. The water event ends around 4 p.m., followed by a prize drawing. As part of the package, participants in the 9-mile course will receive lunch at Rocky Point campground. Four-mile course paddlers eat lunch at Plumas Pines. Along with lunch, those participating will receive one poker hand at the start of the race and an event hat. Cash prizes will be awarded to the best poker hand drawn, and also to the second best. Extra poker hands are $5 each. All paddlers must have an approved personal flotation device on the water. For safety concerns, there will be people in watercraft and on shore monitoring the contestants. Even if people aren’t interested in participating on the water, spectators are still invited to come and enjoy the festivities and cheer on the contestants. Organizers shared a special thanks to the following sponsors: Plumas Pines Resort, Lake Almanor Brokers, Knotty Pine Resort, Rusty Roof, Holiday Market and Dan Smith Construction. Proceeds from the event go to community programs sponsored by the ARPD during the year. For questions and information, contact ARPD at 258-2562 or email [email protected].